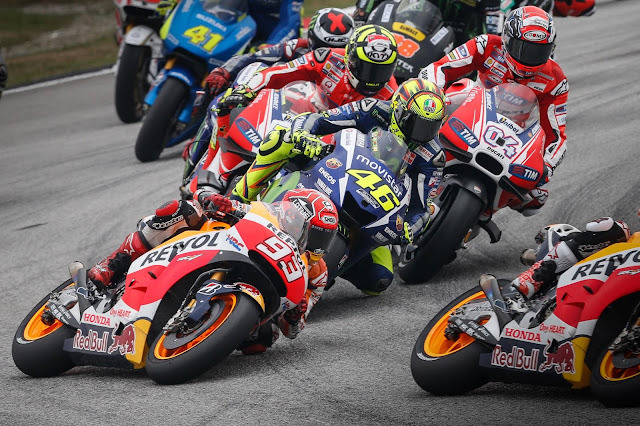 Austria is back in the spotlight as Dorna Sports announces the addition of the Red Bull Ring to the 2016 MotoGP calendar. The next season has, so far, 18 rounds, and several changes to the usual dates can also be spotted on the new list. 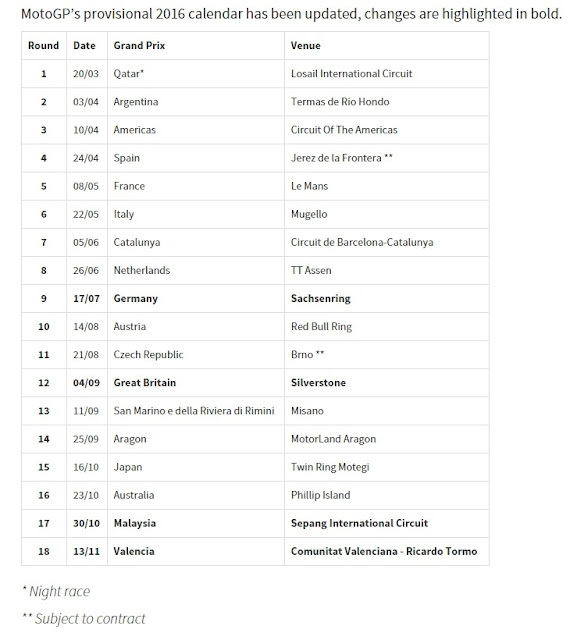 The dates for no less than four rounds were moved, and this happened because of Dorna's will to avoid clashing with the Formula One calendar. It would appear the motorcycle Grand Prix is the one that suffers regarding generic audience each time a round takes place simultaneously with a F1 race. 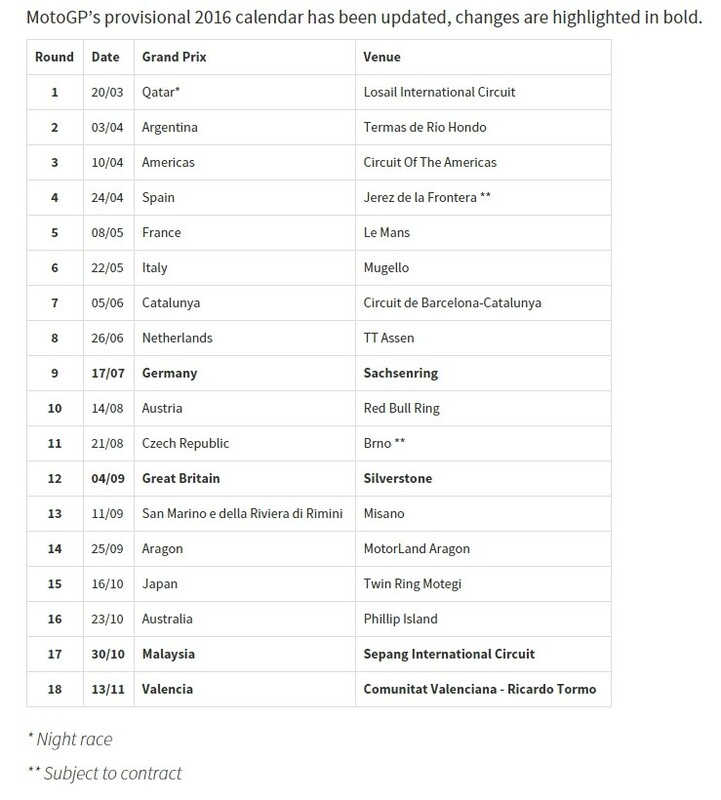 Dorna's new provisional calendar for 2016 sees Sachsenring (Germany), Silverstone (Great Britain), Sepang (Malaysia) and Valencia (Spain) dates moved a bit. This rearrangement sees the 2016 calendar leaving generous three-week gaps between Barcelona and Assen, and Assen and Sachsenring, ahead of the 4-week summer break. Back-to-back races are still present in the 2016 MotoGP calendar, Austria and the Czech Republic, plus Great Britain and San Marino. The overhead triple header kicks off in Japan on October 16 and ends on the 30th of the same month in Malaysia. Two races are still marked as "Subject to contract," Jerez and Brno. These two rounds have been struggling with financial issues over the past year, and their confirmation on the 2016 calendar is expected to arrive next year. As for Austria, the round at the Red Bull Ring (formerly known as the A1-Ring) replaces the US round at Indianapolis. We still have to wait indefinitely for Brazil to join the list, but it looks like other venues might be acting faster to claim a slot on the calendar. The Chang circuit in Thailand may make solid progress the next year after becoming a part of the World Superbike championship. And with Dorna having expressed their intentions of possibly adding rounds to the calendar, maybe 2017 can become a milestone in the history of the sport.